Otto Alexis Schade López, better known as Otto Schade, or simply OSCH, is a Chilean-German architect and artist. He is known above all for his unique paintings in which he perfectly combines abstract and surreal art. He is also an enthusiastic street artist, photographer and sculptor and has even done some collage, print, drawing and installation work. 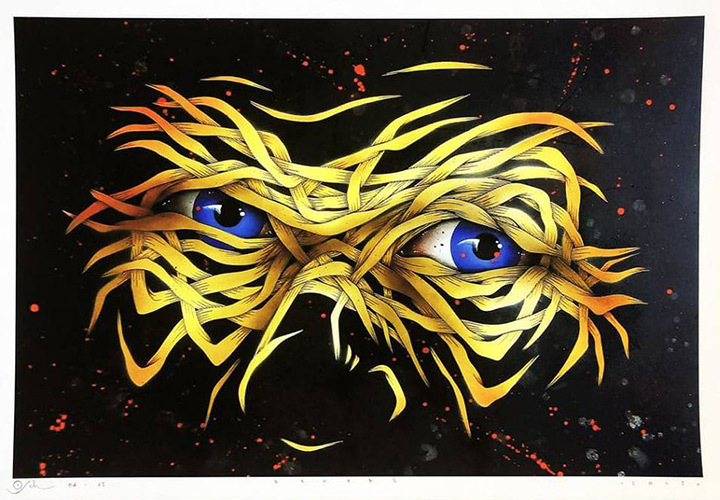 Otto Schade was born in Chile on 30 October 1971. His talent was already visible at a young age when he started drawing. Otto spent his studies at Bio University, studying architecture, building and design in Concepcion, Chile. He never had a art education, but sometime after completing his studies in 1995 he took oil painting lessons. This helped him to grow his artistic skills. Although Otto has received various awards for his architectural performance in public and private projects, the Chilean artist finds his greatest passion in painting. Schade tries with his work of art to “break through the planeness of a canvas”, as he puts it. His style blends the boundaries between surrealism and abstraction. It enables him to show his obsessions and dreams perfectly. In the abstract part of his pictures Schade experiments with layers and creates depth in his three-dimensional images. Sometimes his artwork is inspired by political themes. Growing up under Pinochet’s dictatorship, Schade learned to think as a rebel and produce his work as a reaction to a system. Otto’s paintings are unique in style with a clever technique – often characterized by ribbons painted in layers to create his pictures. As his greatest source of inspiration he names painters such as Salvador Dali, Max Ernst, M. C. Escher and Roberto Matta. The effect of these artists on Otto is especially visible in his surrealistic paintings. The artist’s main choice for the surface is the canvas, although he sometimes chooses the board. Since he began to produce wall paintings and graffiti, the walls of numerous cities have become his “second canvas”. Although Schade has been painting since 1996, his wall paintings appeared in East London in 2009. Since then he has built up a huge fan base around the world. As with his paintings, Otto’s murals combine the fantasy of Surrealism with the freedom of abstract art. His very detailed brand ribbons are also available. Many factors play a role in the irealization of Schade’s ideas. They sometimes depend on the wall itself. Once an idea is formed, he sketches the picture on a sheet of paper, prints it out and cuts the pieces with a laser because of the difficulty of the stencils. When the spraying is finished, he shades the ribbon structures with markers that give them depth and a three-dimensional look. In addition to painting and wall painting, Schade also creates collages, illustrations, sculptures, photos and prints. Schade’s artistic journey and the search for new ideas and inspirations led him around the world. He has exhibited in cities such as Berlin, London, New York, Moscow, Amsterdam and Concepcion, to name but a few. Among his most notable solo exhibitions are the Exposition, which takes place in Luxembourg. And Orbs and Ribbons, which will be hosted by the Fabrik Gallery in Hong Kong in 2014. Otto has also participated in numerous joint exhibitions and art festivals. These include Around the Block 2014 at Well Hung Gallery, London and Urban Barrier 2012 at Ben Oakley Gallery.